Perhaps it’s because I consider Joy Division to be one of those bands that will forever be precious of, that I’ve always been a shade sceptical of Peter Hook and the Light’s activities. By which I mean that my scepticism is not solely on account of Hook’s churlish reputation. Granted, if anyone can lay claim to ‘owning’ those bands, it’s probably Peter Hook: his bass wasn’t so much integral to the bands’ sound, particularly that of Joy Division, but defined it. But, feeling conflicted, I’ve passed up on a number of opportunities to see The Light play live, despite the fact that having been born in 1975, meaning that I was simply too young to see Joy Division, or New Order when they were good. 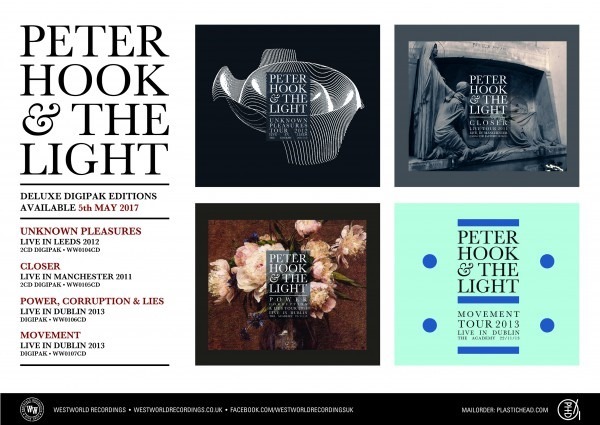 But then there are these four releases, which capture Peter Hook and the Light playing gigs devoted to Joy Division’s two albums, as well as New Order’s Movement and Power, Corruption and Lies. Because the sets include tracks not from the albums in question, they manifest as some sort of ‘expanded edition’ performances, throwing in demos, rarities, B-sides, contemporaneous material and a selection of classics alongside. As such, these performances are a far cry from the ‘greatest hits’ sets Hook so vehemently criticises his former band-mates for, but while as a live proposition it’s all completely valid, one has to ask why the need for the shows to be released. I mean, fine as a memento for those who were there perhaps, but aren’t these releases tantamount to a live album by a tribute band? Maybe, but in fairness, they’re pretty good and in the main do a decent job of capturing the spirit of the songs and the bands at the time they were originally released. The recording of the band’s performance of Unknown Pleasures was originally released digitally in 2012, and features a slew of choice cuts from the Joy Division catalogue, including large chunks of Closer alongside. The performance is solid overall, but it’s certainly a warts-and-all effort, in keeping with disc two of Still and any other live Joy Division recordings you may happen to find. The end of ‘Disorder’ is ropey enough to have been played by the original lineup. ‘Heart and Soul’ is sparse, haunting. It’s followed by ‘A Means to an End’, which is well played, but the guitar heroics don’t sit right. That said, it would be wrong to suggest that the performance is patchy: honest would perhaps be a more appropriate description. Closer was recorded at The Factory in Manchester (where else?) in May 2011, and again, includes a lot more than simply the album from beginning to end. Again, it’s a case of taking the rough with the smooth: the vocals on ‘Colony sound more like Lou Gramm than Ian Curtis, and the high, forced, rock stylings simply don’t work. Still (no pun intended), it’s more hit than miss. Movement stands apart in the New Order oeuvre. The set begins with a stomping version of ‘Incubation’ and there’s a good run of Joy Division material before any New Order songs are reached. The album – played in sequential order – is prefaced by New Order’s debut single, ‘Ceremony’ and transition-marking single ‘Procession’. Somewhere in my collection still lurks a cassette containing bootleg live recordings of New Order from around the time of Movement, including a set at the Retford Porterhouse. It’s a remarkable document of the early, tentative steps of a band finding their way into the light after the greatest moment of darkness. The songs sound brittle, developmental, but their spirit is ineffable. That same atmosphere is recreated with breathtaking accuracy as The Light play Movement from beginning to end: the murky mix, through which stuttering beats hammer nervously is encapsulated so perfectly on ‘Truth’ that it sends a shiver down the spine. This, I had not expected, and it’s enough to challenge the ‘what’s the point?’ position quite effectively. The point, it seems, is that these are great songs, played in the spirit in which they were first played, and this live recording serves as a reminder of just what a killer – and unique – album Movement was, and still is. Power Corruption and Lies, New Order’s second album, released in 1983 is almost universally recognised as the point at which the post-Curtis band began to forge their own identity and in context of the other releases, this is rendered plainly apparent. The sound may still be fractal and sparse, but the focus is very much on insistent grooves and study, propellant disco beats. It also marks the point at which New Order began to produce songs which sounded very like one another, developing the template which would define their sound for much of the next decade. It also reminds us that New Order have never been a vocally-led band, keeping the voice element of their songs backed off and comparatively anonymous. And that works here, as the driving bass and buoyant synths dominate the mix. Listening now, it’s clear that Power Corruption and Lies isn’t only a very dance -oriented album, but also an album of its time, and the fact that Hook and crew faithfully replicate the sound may be problematic in itself: obviously, the fans love it and the entire premise of Hook’s project is to play the songs as intended. But parts of Power Corruption and Lies sound rather dated now. This is no criticism of the band or its fans: I still go berserk over the details of the production of albums I love from the 70s and 80s. Ultimately, it all boils down to context, of course and the current context is, sadly and unavoidably, nostalgia. Wading through the full set of releases is no small challenge, and probably on even the most ardent fan is unlikely to undertake, at least in a sequential or back-to-back context. Critically, I’m still on the fence. But on balance, these aren’t bad at all.